The village is situated south-west of Zbrašín. You can refresh yourself in the local swimming pool in hot summer months. 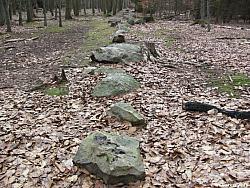 Fourteen mysterious rows of stones, the longest one of them measures 450 meters. Their purpose is not exactly clear, but could be astronomical. A nature trail goes through the place. The wooded plain; a La Téne fortified site with a double mound; a fortified place with mounds and foundations of walls; a game-keeper´s lodge, and the Baroque Church of St Adalbert of Prague from 1706 with the spring well called Vojtěška. On the eastern slope of the plateau hill Výrov (509 m above sea level) are extensive remains of the mounds of the late Hallstatt period settlement. Through the preserved valley runs a nature trail with 10 stops, which focuses on the geological structure and paleontological points of interest of the site. There is a chapel in the village square and near the cemetery, and also a belfry from 1633.